Matt Knicl walked in off the street one day, sat down at an empty cubicle, and has been telling people he is a junior creative intern for Magic R&D. No one has asked him to leave, though, as he has offered to copy edit "everything." He also enjoys losing frequently playing Commander. The man called Taigam is known as Sidisi's Hand, the personal enforcer of the Sultai khan. But Taigam was not always Sultai, and his former clanmates have not forgotten him. 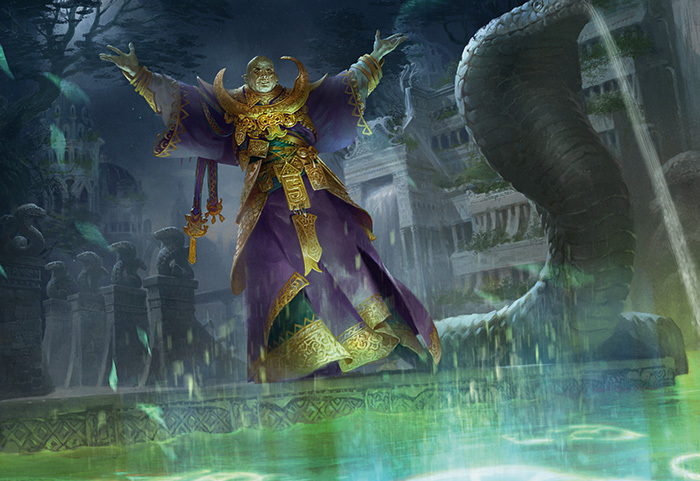 To learn more about the Sultai, check out the Planeswalker's Guide. The Marang River flowed through Sultai territory, deep into the jungle and around many of their most illustrious palaces. Along the river, far from these palaces, were less regal settlements—homes of farmers and fishermen, built on raised wooden stilts and platforms. Although the marshy jungle was inhospitable to most, some had found the means to make a living, but only enough to scrape by. Their stomachs were as empty as their purses, and the small town of Kishla was in debt to the Sultai. They couldn't remember if it was for taxes or outright extortion, but they knew that Sidisi's Hand was there to collect. What the town could call its leadership was a small group of men and women who only were forced to get together and congregate when dealing with the Sultai. The vessel pulled up to the dock. It moved slowly, and the village leaders could see the ropes from the ship's bow leading into the water. The water there was shallow enough they could see the undead sibsig servants pulling the ship, some of their heads partially above the waterline. Many of them had once lived in the village they were visiting. One of the younger leaders retched off the side of the dock. The others kept their composure, having dealt with the Sultai in the past. In contrast to the sibsig, the vessel itself was opulent and covered in gold. A light breeze brought the smell of perfume and spices to the leaders. A human Sultai enforcer lowered the gangplank for the leaders to enter the ship and head belowdecks. The only sound was the clinking of coins. Taigam sat on his chair, an ornate golden throne covered in silk and pillows. He put his hand on the temple of his bald head, closing his eyes, trying to force out the sound. He used to be able to do that—focus his mind to close out all distractions, but that was when he was Jeskai. Weak, idealistic. But Taigam would easily trade strength for peace and quiet. "Unless you've managed to pull gold from the air, I doubt there are any more or less than there have been," Taigam said, annoyed. A deep laugh bellowed next to him. "Do you not doubt that I could perform such a parlor trick?" "I wouldn't doubt that you could, only that you prefer to take from others," Taigam said, massaging his temples. "You'd better shake off that headache, Hand. Your public awaits." Laughter again, followed by the clinking of coins. Taigam had always craved more. As a young man, he never knew what that meant. Growing up in a small fishing village in the shadow of the Jeskai strongholds, he had always thought that meant knowledge. That was how his father had conditioned him. With wisdom came respect, with respect would come a stable life. He had believed that fable, at least for a while. He found he was not a physical fighter, not like the other monks, but his power lay more in his mind. While others mastered pearls or mantis riding, Taigam absorbed the scrolls and the lessons of his teachers. He was still a fighter, but preferred the scrolls. He even had the honor of being trained by the khan of the Jeskai, Narset. She once confessed she regarded him as one of her most adept students. Taigam felt great pride from that comment, but realized that would be the height of what he could get from the Jeskai. Respect? Honor? All for just a stable life? He didn't set out to join another clan. In fact, he had elected to follow the Way of the Wandering Warrior—or so he told Narset and the other monks he had trained with. He hoped to uncover different disciplines of magic, possibly learn different forms of fighting. Taigam travelled to Purugir, the trading post near the Salt Road, hoping to find work as either a teacher or bodyguard. He had always heard of the Sultai as decadent monsters, and although he was inclined to agree, seeing some of their nobles pass through Purugir had sparked his interest. They had rich clothes and exquisite taste. But Taigam sparked their interest as well—a Jeskai looking for work was peculiar. That night, a rakshasa visited him in the inn where he slept. 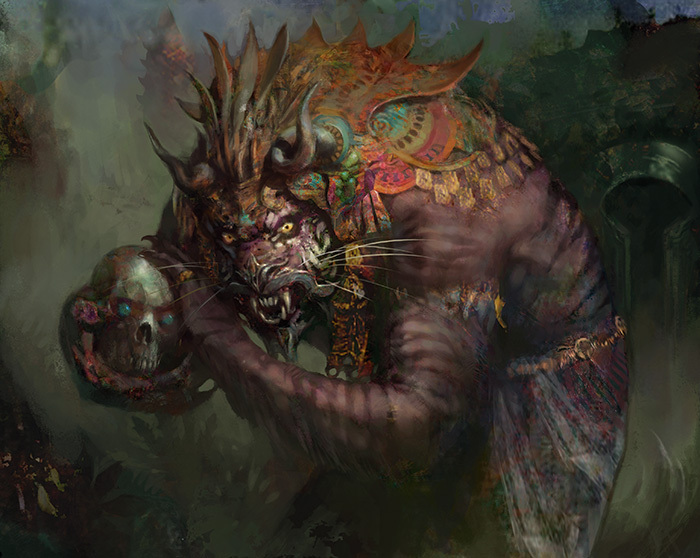 The rakshasa were powerful demons, and the Sultai derived much of their power and undead from age-old deals made with them. That rakshasa, named Ebirri, wished to make Taigam a deal. In exchange for the privilege of being the knowledgeable Taigam's most humble servant, Ebirri would bring Taigam great fortune and power within the Sultai. Taigam knew he was being deceived in some fashion, but the immediate promise of power won out over his common sense. The pact was made, and in exchange for power, Taigam swore his life in service of the rakshasa. Taigam rose to chief advisor of Sidisi, the kahn of the Sultai. The brood tyrant sent Taigam to perform her decrees outside of the palace, which was a great honor, as she usually kept those she mistrusted close to her so she could be the one to end their lives. Taigam executed Sidisi's rule throughout Sultai territory, all under the watchful eye of his true master, Ebirri, who had bound himself to Taigam. The farmers stank. Not even the spices and perfumes that covered the smell of a wet sibsig could remove the stench of the peasants that stood before Taigam. They looked worried—they always looked worried—and seemed unsure if they should speak or wait for Taigam to begin the proceedings. Taigam was content with sitting back in his chair, making them squirm a little longer. These were not true Sultai. They were those who had the poor fortune of being born in Sultai territory, and although they were required to give tax and food to the Sultai, they had less value to Sidisi than a sibsig. An older man, a rarity in these parts, stepped forward to speak, which shocked Taigam, as one didn't gain gray hair by speaking first. "My lord Taigam," he said, as he lowered his head, stepping forward to approach, "our next shipment will exceed the current quota and make up for what the last shipment lacked." The man was clearly guessing as to why the Sultai were there, and it was a good guess. Taigam was disappointed at the level-headed response. He wanted to have fun. "Why do you not kneel in the presence of your better?" Taigam asked with a smirk. The man took to a knee, and knelt. Taigam cleared his throat, and the man repositioned himself so his forehead was on the floor. The rakshasa Ebirri laughed from the shadows. "If you want him to bow any lower he should bow from below the deck." Taigam hid his anger at the comment. The man didn't rise from his prostrate position. "Now you have two," Taigam said. He nodded to the human guard, who nodded back and left the ship. Outside, on the river, the sibsig stood in the water, tethered to Taigam's boat. Blurred figures ran fast on the water, using the sibsigs' heads as stepping stones. As the guard sent by Taigam was exiting the ship to enact his task, half a dozen small daggers riddled his body and he fell over, dead, before he realized what had happened. The figures ran up the tethers, ready to perform their task. Taigam would not have time to revel in his cruelty. From the sides of the ship, three blurred figures flew through the windows into the room. Three human Jeskai monks stood with clenched fists. They dashed toward Taigam. The peasants ran the opposite way, heading toward the door. "By Narset's will!" one of them shouted. Taigam moved to stand. He was able to dodge the first fist, but the second caught him in the shoulder, sending him spiraling to the floor. 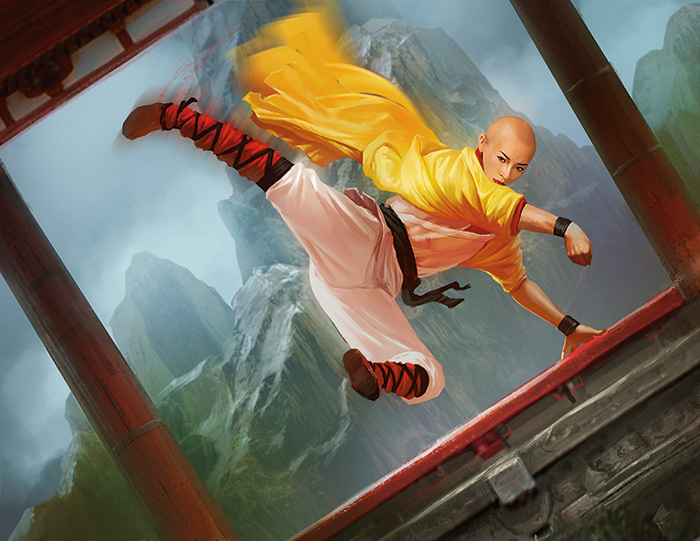 Rusty, but not completely out of practice, he used the momentum of the fall to send his foot out to kick the first monk in the leg near the knee, bending the monk's leg the opposite direction. The monk cried out in pain and fell over. Ebirri emerged from the shadows. One of the remaining monks threw daggers at Taigam, but the rakshasa growled in their direction and they fell to the ground as though hitting an invisible wall. Although Ebirri usually hunched over, the feline demon then stood tall, nearly hitting his head on the ceiling. Taigam pulled himself from the floor and saw a chance to free himself from the demon in the confusion. As the rakshasa willed dark magic, purple mist emanated from his eyes toward one of the monks. Taigam drew a dagger from his ankle and rushed toward the demon. Although the assassins were there to kill him, Taigam knew the greatest threat to his life had always been the rakshasa. The remaining monk grabbed Taigam's arm, but the Sultai spun away, tossing his dagger to his other hand and striking at the rakshasa. The dagger stuck in Ebirri's side, interrupting his concentration, and the monk who was hovering in the air, strangled by smoke, fell to the ground. Ebirri roared and backhanded both Taigam and the monk who held him. They both slammed into the wall, but the monk was not deterred. He punched Taigam in the throat, interrupting Taigam's breathing. The rakshasa grabbed the monk by his clothes and pulled him back, then grabbed his head. Ebirri crushed it, exploding brain and skull all over the cabin. The uninjured monk had recovered, but Ebirri continued his spell and choked the life from the monk with his dark magic. Taigam finally caught his breath, and the hulking rakshasa picked him up by his clothing and pulled him close, so the Sultai's face was next to his mouth. "I own you," Ebirri growled. The rakshasa dropped Taigam, who picked himself up. There was still a monk alive, but unable to move due to the damage to his leg. "Who sent you?" Taigam asked. "Narset, khan of the Jeskai," he said with contempt, cringing through the pain. "That doesn't seem like her," Taigam replied. "Are you saying she sent you, or that you act in her name?" The monk didn't reply. Taigam nodded to Ebirri, and the rakshasa stepped on the monk's chest, crushing him. "Do you think the Jeskai khan meant to end you with assassins?" Ebirri asked. "No," Taigam said. "They were zealots, most likely acting without her knowledge. I'm sure there are still many among the Jeskai who would like to see a mistake like me removed from the picture. Still, things have been escalating lately, so I can't be sure dear old Narset hasn't finally become more of a threat. I'll take care of it." "I'll take care of it," Taigam restated, more forceful. Ebirri didn't reply, but returned to the shadows. 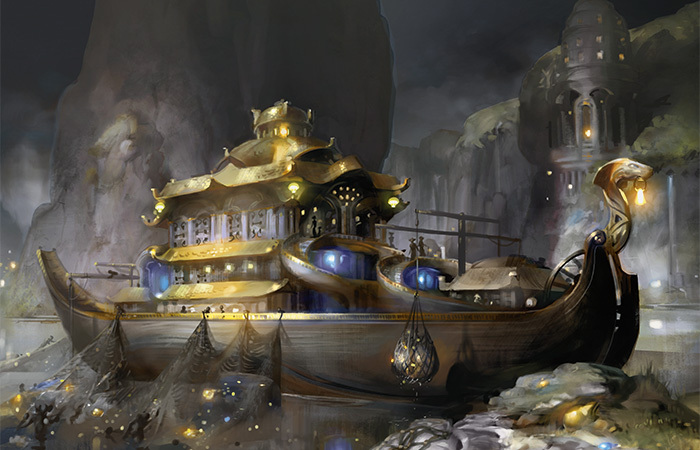 Taigam signaled the sibsig to keep the boat moving as he began to size the intact dead monks for golden uniforms.